It should be stated and restated that codes and code enforcement vary from location to location within the US. The IMC (International Mechanical Code) is one of the most widely utilized and referenced and the 2015 version of the IMC section 307 is what I will be referring to in this article. The code as it relates to condensate disposal in the IMC is pretty vague. It says that it must be disposed of into an “approved location” and that it shouldn’t dump on walkways, streets or alleys as to “cause a nuisance”. IMC 307.2.2 tells us that an A/C condensate drain inside diameter should not be smaller than 3/4″ and should not be smaller than the drain pan outlet diameter. 3/4″ is sufficient for up to 20 tons according to the IMC unless the drain outlet size is larger than 3/4″. The IMC dictates a 1% minimum pitch of the drain which is equal to 1/8″ fall for every 12″ (foot) of horizontal run. In practice, it is safer to use 1/4″ of fall per foot to ensure proper drainage and provide some wiggle room for error. Drains can be made out of many materials but PVC is by far the most common. When a drain line is PVC the IMC dictates that it should be supported every 4′ when horizontal (while maintaining proper pitch) and every 10′ vertically. 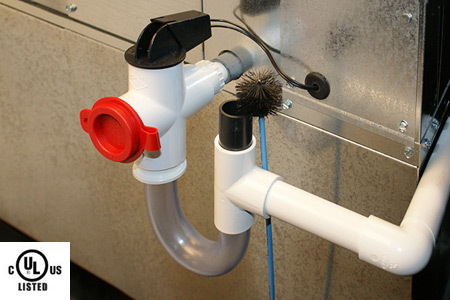 IMC 307.2.5 states that the condensate assembly must be installed in such a way that the drain line can be “cleared of blockages and maintained” without cutting the drain. The IMC states that condensate drains should be trapped according to manufactures specs HOWEVER, wording was added in IMC 307.2.4.1 that states that ductless systems must either have a check valve or a trap in the condensate line. While most manufacturers don’t specify this on this gravity ductless drains, it is something to look out for. Venting after the trap (like shown on the EZ Trap above) is a really good idea in most applications because it helps prevent airlock that can occur due to double traps and shared drains as well as prevent siphoning. This vent is AFTER the trap and must remain open to be effective. The vent opening should always rise above the trip level of the condensate overflow switch when it is in the primary drain line or pan or above the secondary / aux overflow port on the primary drain pan. This helps ensure that if a backup occurs that the water properly trips the switch instead of overflowing out of the vent. While venting is a common best practice it isn’t part of the IMC code. Mechanical system piping insulation. [/b] Mechanical system piping capable of carrying fluids above 105?F (40?C) or below 55?F (13?C) shall be insulated to a minimum of R-2. but this really isn’t talking about condensate drains when read in context. Some municipalities do require that horizontal portions of drain inside the structure be insulated to prevent condensation and this standard makes sense to me. In Florida we always insulate horizontal portions of the drain because if we didn’t we would have consistent issues with growth and water damage due to the high dew points. IMC 307.2.3 states that all HVAC equipment that produces condensate must have either a secondary drain line or a condensate overflow switch, a secondary drain pan with a secondary drain line or condensate switch or some combination of these installations should be used to prevent overflow if the primary drain line blocks. Sir my one question is it me handel 90 tr dx centerl plant and screw compressor but customer requirements is no air re sarulation .because of progress site toxic type smell his requirements is a 100’/.present fresh air in throw cooling coil and in the process site also exuast air out.so Plz give me best system design. Thank u. Recently learned for 5 ton draw-through systems, the 3/4″ PVC exiting the coil needs several inches of vertical drop to sufficiently create enough water volume & weight to stop back pressure which clearly created spillage/leakage from the drain pan. The picture in the article for a 5 ton system would NOTt be nearly enough to overcome the negative air pressure caused by draw-through air pressure and thus result in coil pan pan spillage.